Sgt. Alvin C. York, Sergt. Alvin C. York: This is the story of Sergeant Alvin C. York who fought in World War I (WWI) and became its greatest hero. This is the story of Sergeant Alvin C. York who fought in World War I (WWI) and became its greatest hero. the badge of nobility; and The Congressional Medal of Honor. Copyrighted and Published by Harper & Brothers Publishers: New York in 1920; pages 13 - 16 and page 18. SIX feet tall, weighing a trifle over two hundred pounds, brawny as becomes a man whose time was divided between blacksmithing and farming, clear-cut and strong of feature, kindly of disposition but positive and resolute by the testimony of keen blue eyes and flaming red hair -- that is the general description of Alvin C. York, native of the Tennessee Mountains, extraordinary hero of the Argonne Battle, and modest withal. There is no story of the great war that reads more like an extravagant fiction; but it thoroughly attested, its truth unquestionably established by official investigation and by the sworn statements of fellow soldiers as one of the most amazing individual achievements in the four years crowded with deeds of almost credible heroism and daring. Infantry, 82d Division, A. E. F., during options in the Argonne sector, killed twenty-five Germans, captured 132 prisoners, including a major and several lieutenants, and put out of commission thirty-five machine guns -- did it by his "lonesome," subduing the machine gun battalion with his rifle and automatic pistol. Now, the thing that gives vivid additional interest to the thrilling story is the fact that its hero was an elder of the Church of Christ and Christian Union -- a sect scrupulously opposed to any kind of fighting and firm as conscientious objectors to war -- and was one of the most devout and earnest members of his home church, in Pall Mall, Tennessee. And thereby hangs a romance! Sergeant Alvin C. York (© Underwood and Underwood) - As Corporal York of the 328th Infantry he captured 132 prisoners, killed twenty-five German machine-gunners and put out of operation thirty-five machine guns. of all the world" urged him to join the church. So he waited a year, thinking the thing over. Convinced that it was the right course to pursue, he joined the church in 1915. When the United States declared war and conscription came, York was second elder of his church and, naturally, pastor and congregation urged him to abide by the doctrine of the church and claim exemption as a conscientious objector. He was sorely troubled. He believed in his religion, was soulfully committed to it, but he loved his country too -- and patriotism is also a religion. He refused to claim exemption, and went with the draft to Camp Gordon in Georgia, but was obviously unhappy in his divided duty. He talked many times on the subject with Captain Danforth and Major Buxton. In addition to much reasoning they cited scriptural passages from the Old and New Testaments, that convinced him there are times when the sword is the instrument of divine justice, and before the 82d Division sailed for France, the conscientious objector declared himself satisfied that he was on the right course, and gave himself wholeheartedly to the duties of the soldier. And a good soldier he was, cheerfully, promptly obedient to orders, quick in mastering details, and distinguished by the cool, positive conduct of the self-reliant by habit and of the fearless by nature. He was made Corporal of Company G, 328th Infantry, 82d Division, a division made up of representatives of every state in the Union, hence the A. A. 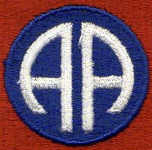 (All-America) in its insignia. Over the sea went the 82d and was speedily action, doing valorously in the Meuse-Argonne battles. And then, Oct. 8, at 6 o'clock the morning, the 2d Battalion of the 328th, Corporal York with Company G, set off from Hill 223 with the Decauville railroad as its objective, two kilometers to the west. They had to cross a valley of several hundred yards and climb the ridges of a hill, all the time rider machine gun fire from three directions. The guns from one hill had the Americans enfiladed, and Acting Sergt. Bernard Early was ordered to take two squads, and put the guns out of action. Early had sixteen men under him, one of whom was Corporal York. They set out to climb the hill with a heavy fire from a ridge at their backs, but the density of the trees and brush permitted them to get beyond observation without loss, though bullets continued to cut through the trees as they struggled and stumbled upward through the tangle. They crossed the crest and began the descent of the opposite slope, and suddenly, on the farther side of a little stream they came upon a group of Germans, twenty to thirty in number, seated on the ground for a meal. Back home again in the Tennessee mountains. The Americans fired and there were a few return shots, but the majority of the surprised Germans threw down their guns and held up their hands in sign of surrender, and the others followed suit promptly, including the major in command of the battalion. They were amazed to find that their captors were American. swung round, and from the slope above Early's detachment, began a fusillade. The German prisoners at once dropped down and lay on their bellies as did some of the Americans, others seeking the shelter of trees. Six of the little detachment were killed outright. Early was shot three times through the body and Corporal Cutting and Private Muzzi were wounded. On one side of York was Private Wareing, on the other Private Dymowski, both shot to pieces, York untouched. This fire reduced the party to eight, York and seven privates. Of the latter, one was pinned behind a tree, the others were guarding the prisoners. That is the testimony of the men themselves. They did no shooting. "ALL THE TIME I WAS A-USING MY RIFLE"
York, when he dropped at the first fire of the machine-guns, found himself in a little path by a clump of bushes; the machine-guns were peppering from a distance of less than thirty yards, cutting off the tops of the bushes about York. On his return to the United States May 22, 1919, York said to a reporter: "I sat right where I was, and it seemed as if every gunner was a-firing straight at me. All this time, though, I was a-using my rifle, and the enemy he was a-feeling the effects of it. One of our boys yelled that it was impossible to get the best of the situation, but I yelled back `Shut up !' I knew one American was better than ten Germans if he kept his wits." He had no thought of surrender and "Somehow, I knew I wouldn't be killed." Aiming as he used to when shooting off the heads of the turkeys, he potted Germans in the "foxholes," those firing from behind trees or over logs, with deadly precision, himself lying low to have the protection of the German prisoners prostrate between him and the machine guns. He was not the man to miss a mark at that range. One boche had the indiscretion to rise in order to fling a, small bomb at the rifleman. The bomb missed its object; not so the responsive bullet. "I got him square," said York. "I WHIPPED OUT MY AUTOMATIC"
On the way they stirred up several more machine gun nests, one of which put up a fight and York felt it a regrettable necessity to "shoot a man there." After that when a nest was flushed the Major touched him on the arm and said, "Don't kill any more, and I'll make them surrender." This was done and the hill was pretty well cleared up before they got to the other side and York's herd of prisoners numbered 132, counted and certified to by Lieutenant Joseph A. Woods, Asst. Division Inspector, as they were reported to the P. C. of the 2d Battalion, 328 Infantry, that same Oct. 8. American Army, but upon the American people. Your deeds will be recorded in the history of the Great War, and they will have an inspiration not only to your comrades but to the generations that will come after us. I wish to commend you publicly and in the presence of the officers of your division." 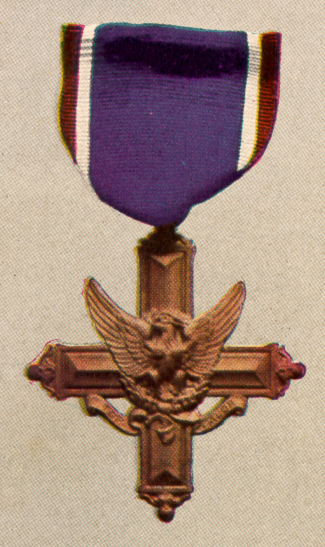 Then the French, to whom valor is a thing of divine sanctity, awarded him that enviable soldier's treasure, the Croix de Guerre, and in presenting it to him Marshal Foch, who knows right well what brave deeds are, told him that his was the greatest act of bravery and presence of mind under great stress performed by any soldier of the Allied Armies. Add to this that badge of nobility, the Congressional Medal of Honor. But with the two crosses on his breast and the medal in prospect, Sergeant York had a light in his eyes and a hesitant smile on his lips when he spoke of a Tennessee girl, "the prettiest in the state," that rather suggested the idea that in his opinion his proudest distinction would be when Miss Grace Williams became Mrs. Alvin York. "I FEEL A HEAP STRONGER SPIRITUALLY"
And what could he say to the Church of Christ and Christian Union Pastor and members waiting to welcome him home to Pall Mall and into renewed fellowship? Probably what he said to the reporter who asked him a leading question. When he was drafted he had no real idea what the fighting was about. "But when I got to camp," he said, "and my officers told me we were fighting for democracy and peace on earth and for the protection of the small nations, then I knew it was no sin to kill. In fact, I feel a heap stronger spiritually than before I went over to fight. No man could go through what I did without the help of God. I feel He gave us our great victory because we were in the right. "It is a unique distinction for me to have on one side of me the Admiral who safely conducted all of our troops overseas and on the other side one of the most distinguished soldiers the world has ever produced. His deeds are of the character that will go down in history for our boys and girls to read of and admire. "York was awarded his medals for having been the leader of a small party which brought in a large number of prisoners after he had killed twenty-five. When I heard of his feat I ordered a full investigation, which resulted in the award of the Congressional Medal. I am happy to see your society doing honor to a man who so thoroughly deserves it. "I hope your unprecedented policy of banqueting a non-commissioned officer will be forever followed and honor done to the man who carries the gun -- the man who goes over the top." Source of image: The United States in The Great War by Willis J. Abbot; Leslie-Judge Co., New York. Copyright, 1919 by Doubleday, Page & Company. (328 pages). Sergeant York Patriotic Foundation - includes his diary. Description: This is the story of Sergeant Alvin C. York who fought in World War I (WWI) and became its greatest hero. His hometown was Pall Mall, Fentress County, Tennessee. These are the Decorations and Honors that he received: Distinguished Service Cross; Croix de Guerre; the badge of nobility; and the Congressional Medal of Honor. This page was last updated on 01/31/03. Copyright © 2000-3 by P. Darlene McClendon. All Rights Reserved.